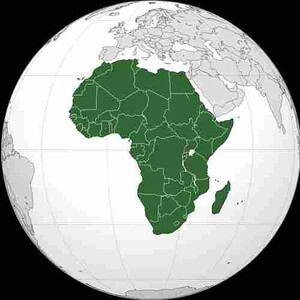 The map of Africa is one of the most nonsensical and artificial things on Earth. With the exception of the recent border between Sudan and South Sudan, every one of the lines on the map was drawn by European powers without any regard to the reality on the ground. This becomes especially obvious when you notice the patchwork of European languages which make up Africa. On this trip we left Cape Town where English is the common language, but many of the European descended population speaks Afrikaans, which is derived from Dutch. North in Nambibia, you can still find a small population of German speakers. Above that in Angola, all the signs and the common language is Portuguese. North of Angola is the Congo where French is widely spoken. Go a bit further and you’ll find Spanish speakers in the tiny nation of Equatorial Guinea. Keeping going north of the Sahara and you’ll find people speaking Arabic. None of these of course are native languages to Africa. If you look at a tribal or language map of Africa, and it looks even more fragmented than the current map and has no relation whatsoever to the current borders. Many of the problems which Africa has had since decolonization has been an indirect result of the way the borders were drawn by the European powers. The ironic thing, is that the borders are now pretty much locked into place because each country now has an elite which has benefited from the status quo borders. So, tribal groups are split up with majorities and minorities depending on what side of the border they are on, resulting in cronyism, tribalism and ethnic conflicts. The events of the 18th and 19th century are still effecting things today. We never really escape history. Wish my life is same as yours. I also love travelling but can’t do it due to financial problems. I salute you.